They’re the reason clothing companies created “tagless tees” – because tags chafe and itch, and otherwise drive you batty. 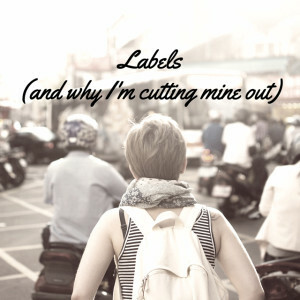 (My grandmother used to cut all the tags out of her clothes; as soon as it came in her house, out went the tag. Not so helpful when trying to identify an article of clothing by size, or looking for laundering instructions…) Of course, you probably realize that I’m not talking about -those- kind of labels, but you know what I mean. We as a society tend to label ourselves and others according to the things we do. Can I tell you how crazy it makes me that the first question folks ask when they meet someone new is “what do you do for a living?” – not “what kinds of things are you super-passionate about” or some other (deeper) question. We get caught up in these superficial interactions, as though knowing that someone you just met is an accountant, and you’re a dentist, and… where do we go from there? Zzzzz. That being said, if what you do for a living really sets you on fire, absolutely consumes you, and you love it enough for it to define WHO you really are, how you want other people to see you? That’s freaking awesome. Kudos to you. For me? I have recently come to the conclusion that while labels can be helpful in some cases (if fitting us into neat little boxes is actually helpful), they’re awfully constraining. I’ve talked a lot about finding your “hell yes” – some of those labels above were at one point or other (or currently) a passion of mine. However, they are not all a hell yes right now. By identifying as any of the things above, I often find myself less willing to be open to something else. Like I talked about earlier in the year in my post about saying yes more, many times it would behoove us to let go of preconceived notions and try something new. Tried something new and it’s not a “hell yes”? Don’t do it again. Something that you used to identify with no longer a “hell yes”? No reason to hold yourself to it, if it no longer resonates. This path we’re all on is different for each of us. Chances are, it’s going to meander quite a bit: curving here and there, occasionally taking a sharp turn, sometimes uphill and other times down. The important thing is to enjoy it while you travel it. You may get tired of hearing me say it, but life is short. Enjoy your path. And don’t worry if you have to rip the labels out along the way.